Pears have a delicate, sweet flavor with a crisp texture. Pears taste best when they ripen OFF the tree. Therefore, pears are transported from the farm when they are mature, but not always ripe. This assures that the pears you buy are in good condition and not damanged by transport. Pears need to ripen at room temperature, so leave them on the kitchen counter or dining table to enjoy their beauty as they ripen. Placing pears in a paper bag will help them ripen faster. Once they are ripened, pears will keep in the refrigerator three to five days. While a Bartlett's skin color brightens as it ripens, most varieties of pears show little change in color. The best way to evaluate ripeness for other pear varieties is to "Check the Neck". Apply gentle pressure to the neck of the pear with your thumb. If it yields to pressure, it is ripe. 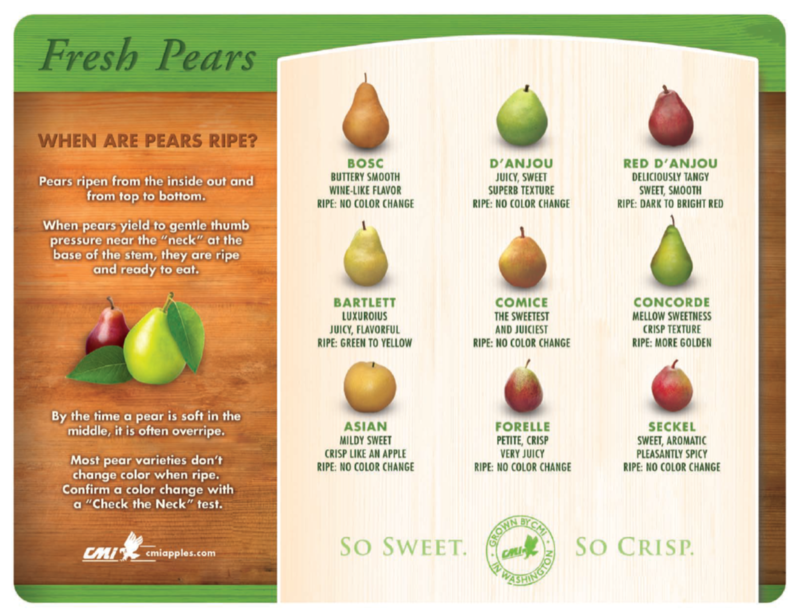 View our Pear Ripening Chart here. Wash the entire exterior of the pear, even if you plan on peeling it. Pears are a nutritous out-of-hand snack or try dicing a pear into a salad for a light, crisp lunch.